HandKrafted by Stephanie: MTME October Release Day!! Hello! Today is the My Time Made Easy © October release day! All the products that the team has been peeking are now available in the store HERE!! There are 8 new stamp sets, 4 digital stamp sets, 5 templates and 3 cut files.. The entire team is posting, so you won't want to miss any of it. Now, on to my project for today...﻿ I have a little "Boo" gift set (for those of you unfamiliar, "You've been Boo'd" is the Halloween equivalent to Secret Santa). I used the In Suspense © template. 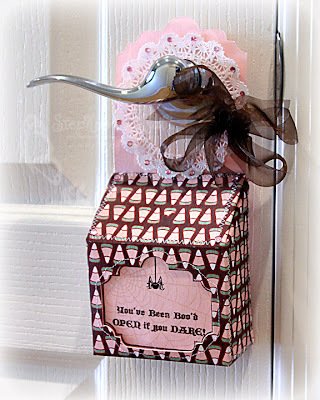 The idea behind this template is to not only "suspend" it from the door knob of the recipient, but to also put them in "suspense" of what surprise could be hanging on their door. What a wonderful treat to find, no matter what the occasion! I printed a sheet of Sara's Chocolate Candy Corn digi paper (from the Chocolate Halloween collection). 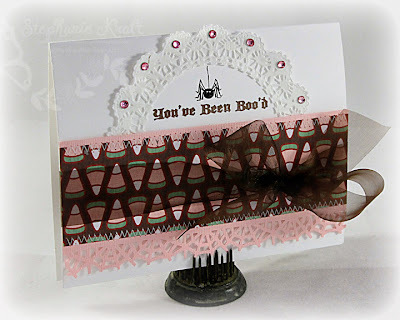 I just love this pink/brown/green color combination.. it makes for a fun change from traditional Halloween colors. I only wish they made candy corn this color, too! The template has an optional cut-out window. I opted to cut out the window and add a layer of pink cardstock inside (you could also use vellum or even acetate to create a clear window). Below is a closer look of the window portion. You can see the outline of the label (from A Secret Surprise ©) that fits perfectly inside the cut-out. 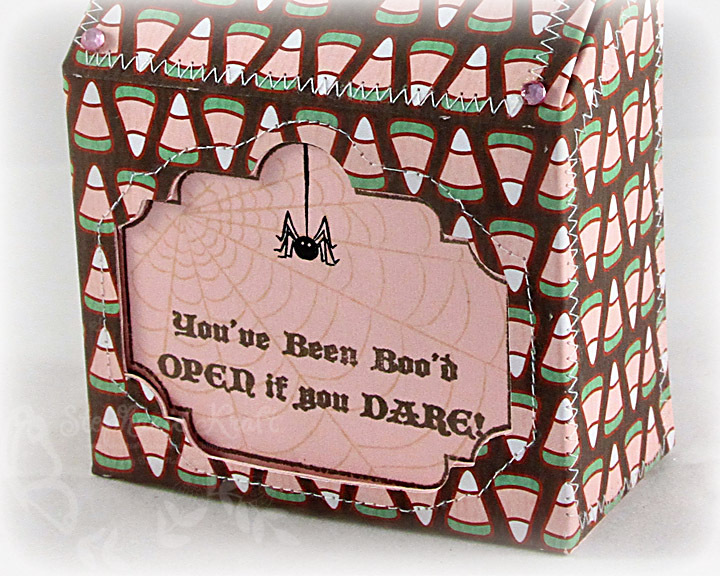 The spider web, spider and sentiments are all from Catherine's sweet Halloween stamp set, A Spooky Surprise ©. I added stitching around the box and tied some sheer ribbon onto it. 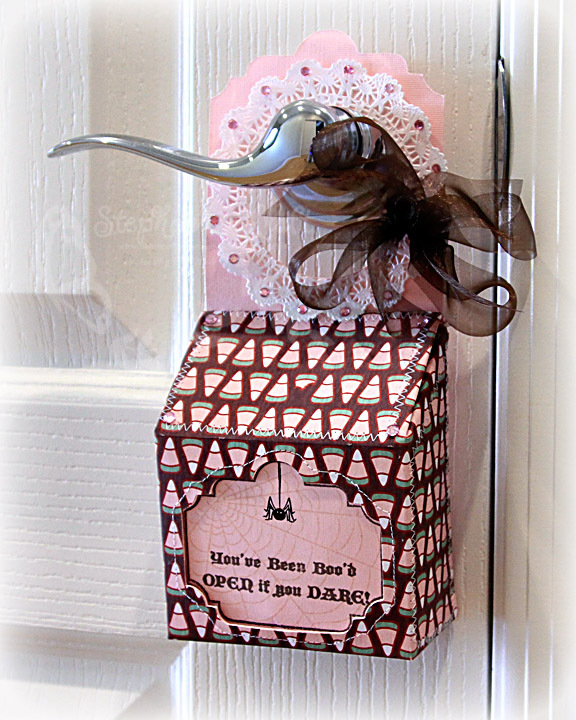 I cut out the center of a doily (with a Spellbinders Standard Circle Nestabilities die) and put it around the portion that hangs on the door knob. I added pink rhinestones on the scallops around the doily. Below is a closer look at the top portion of the template. Here's another look at the matching card. I copied the cut-out doily theme here and kept my card fairly simple. 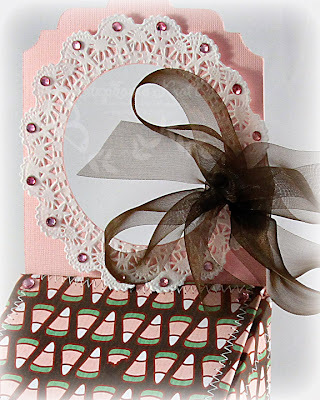 Accessories: In Suspense © template (MTME), Standard Circle Nestabilities (Spellbinders), Spider Web border punch (Martha Stewart), Rhinestones (Pizzazz Aplenty), Sheer ribbon (May Arts), Doilies (Sarah Martina Parker's Etsy shop), Thread, Sewing machine. So cute! I love the pink green and brown color combo! Darling as usual!! Great color combos! Oh my gosh Stephabnie! Who knew Halloween could look so elegant?! This is just gorgeous! So cute & pretty Stephanie all in one! Love all the beautiful details: the lacy doilies, rhinestones & punched border! Oh my goodness this is just stunning Stephanie!! Love the Pink and Brown. Stitching is wonderful as usual and I love the sentiment in the window :)..Great job !! That's almost too pretty for Halloween! 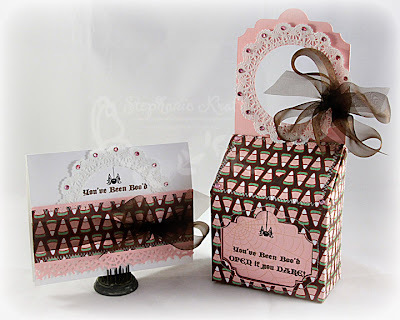 Gorgeous card, Steph! I love these colors, rather than the traditional "halloween colors." Of course, the pink rhinestones are my favorite!! What a sweet set Stephanie, I love the colors and your stitching! De-lightful; de-lovely; de-licious Steph - I LOVE this set - the doily, rhinestones and your paper choices - you can "surprise me" any time LOL. Very sweet, Stephanie! I LOVE this in the non-traditional colors!